BSc/project thesis: Development of a tool to measure surface properties on curved shapes - TalkING. The surface properties of marine structures play in some disciplines a very important role. 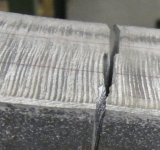 In fatigue analysis the depth and shape of notches or grooves plays an important role (Figure). The surface roughness and surface profile can be well measured on straight specimens. However, if specimens are curved (Figure) the measurements are either not reliable or not functioning at all. Literature review on the definition and measurement of surface roughness and the state of the art of its measurement. Design a device that allows surface roughness testing on straight and moderately curved specimen.